Sole treadmills have become one of the top-selling treadmill brands — and with good reason. 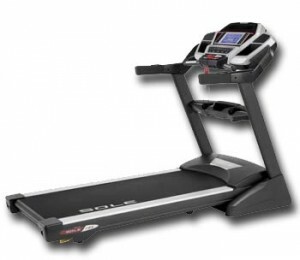 Sole makes a high-end folding treadmill with a high-end warranty and they sell it at a value price. The Sole F85 treadmill is the top of the Sole line, and it’s one of the best running machines on the market at a price that can’t be beat. Let’s take a closer look and see exactly what makes the F85 so great. If you like it, buy it from us and save $500! When it comes to running machines, it’s all about the workout. And the treadmill workout is where the F85 delivers with a rich set of features. To get you moving, the Sole F85 treadmill goes up to 12 mph. That would get you running at a 5-minute-mile pace — if that’s not fast enough for you, then you’re probably a professional athlete with lots of other running workout options. You can add an incline of up to 15%, which will really kick up your treadmill workout to another whole level. Compared to running on a level surface, adding some simulated hills with the incline can activate almost 10% more muscle groups with every stride you take. So the incline is your friend. 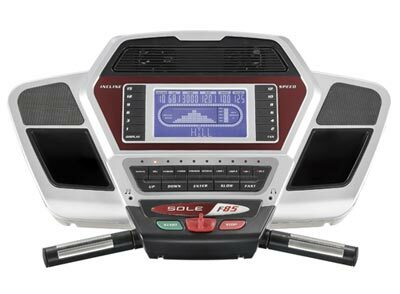 The Sole F85 console features 6 pre-programmed workouts and a message board. The fitness-club style backlit LCD display has the standard treadmill display of time, speed, pace, distance traveled, calories burned, and heart rate. The console also features 6 pre-programmed workouts and 2 heart rate workouts. Plus, you have the the ability to add 2 of your own custom treadmill workouts. Depending on the program, the display also allows you to follow your progress running along a 1/4 mile track display or your progress up and down incline hills on a peak and valley graph. 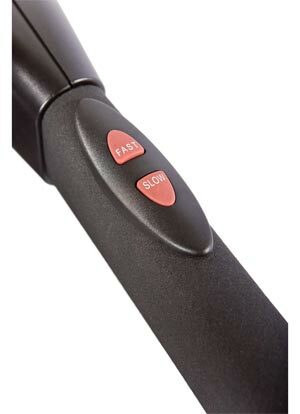 Conveniently, you can control both the speed and the incline with buttons that are built right into the armrest. So it’s incredibly easy to adjust your workout to your specific needs. It’s much easier to hit the large armrest buttons than to make adjustments via the the several buttons on the display panel. All sole treadmills come with the built-in Cushion Flex suspension system built into the deck. This helps you get joint-friendly workout that provides a 35% lower-impact workout than running or walking on asphalt. The F85 also comes with a wireless chest strap heart rate monitor so that you can make sure you are pushing yourself hard enough, but not too hard. The monitor is is rated to be 99.9% accurate. And if you are using one of the two built in heart heart rate control programs, the Sole will use your age to automatically calculate your target heart range and cater your workout accordingly. This will help you get a cardio workout that’s both safe and efficient. The Sole F85 treadmill display console also includes a message board like the ones you see on super high-end running machines at the gym. The message board is a scrolling text board that assists you with setup and guides you through your workout. So if you are wondering how to customize one of the workouts, the message board will walk you through it with out needing to did out the user manual. You’ll get valuable feedback and guidance during your workout, and when your done the message board will give you a summary recap of your progress. The Sole F85 Treadmill folds easily to save you space! The F85 is also a space saver. Sole Treadmills are built with a double horseshoe folding frame and their trademark Easy Assist folding feature which allows anyone to effortlessly fold up the treadmill, saving a huge amount of space. And when you are ready for your workout, you can easily and safely lower it and your ready to run. Unlike some of the lower-end Sole models, the F85 also sports built-in cooling fans and built in speakers. So you can plug in your iPod or favorite MP3 player and rock your workout without needing to fiddle with ear buds or headphones. Sole doesn’t save money by cutting corners. They build a solid treadmill and back it up with a fantastic warranty. The motor, deck and frame have a lifetime warranty and the electronics, belt, and rollers have a 5 year warranty. It’s all backed up with 2 years in-home labor service. Talk about being built solid: the F85 sports a 3.5 horsepower continuous duty motor and the welded frame is all steel, enabling the treadmill to accommodate runners up to 400 pounds! The frame is welded, not bolted. And it’s finished with an epoxy powder coated paint that’s baked on, so it’s incredibly durable. The 35″ by 80″ inch deck, with a 22″ wide by 60″ long running surface, should handle anyone. A large running surface like this can definitely be a strain on the motor, but at 3.5 hp this motor can easily handle it and you won’t have trouble with it burning out. Remember: they back up the motor with a lifetime warranty! The F85 is overwhelmingly popular with with 80% of respondents giving it their top rating. But as with any treadmill, it’s possible you might run into some problems with the Sole F85. That’s where customer service comes in. And Sole has fantastic customer service. We regularly see comments from Sole owners like “My experience with customer service was 100% positive.” and “Sole’s customer service is excellent.” The superb customer service combined with the bullet-proof warranty should help you sail through any problems — in the unlikely event that you have any. Sole’s suggested retail price for the F85 is $2,499 plus shipping. But if you can now buy it from Amazon for $1,999.99 with free shipping. This is a great deal that makes the Sole F85 one your best choices for a quality in-home cardio workout! Do you already have a Sole F85? If so, let us know your experience by leaving a comment below or contacting us. Previous post: Elliptical vs. Treadmill: Which Should You Buy?